Alien Covenant comes to DVD and Blu-Ray on August 15th in America and later September 18th in the UK. Here’s my review of the regular 1080p Blu-Ray release – this is my second viewing of the movie after my theatre experience in May. You can buy the Alien Covenant Blu-Ray on Amazon.com or Amazon.co.uk. Well, that went by quick. It doesn’t feel like much time as passed from seeing Covenant in the cinema to viewing the Blu-Ray. For the first time since joining the fandom, I came out of the cinema back in May thoroughly pleased with a movie in this series. As Prometheus started out as a direct Alien sequel, it was later changed to a more stand-alone film set in the Alien universe. Alien Covenant reverses everything and instead of Prometheus 2, we get a proper Alien sequel this time with Xenomorphs. I do recall Fox were struggling to come up with a story for a Prometheus sequel. 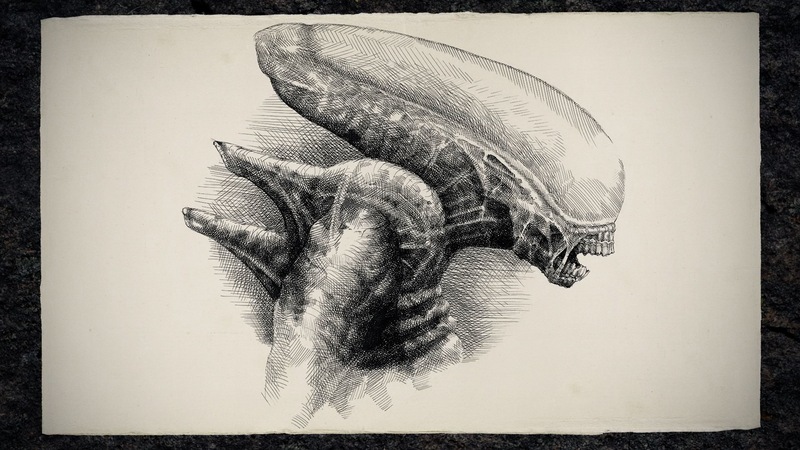 Alien Covenant’s story was originally written by Jack Paglen and Michael Green (Logan) while the screenplay was written by Dante Harper with extensive re-writes by John Logan (Gladiator). The story takes place over 10 years after the events in Prometheus and follows a colonization ship called the Covenant which is carrying 2000 colonists in hypersleep to a remote planet. The ship is damaged on route and when the crew emerge from hypersleep, they hear Shaw’s distress signal from another planet. They go to investigate the planet and find David the android from Prometheus as its only inhabitant. Unfortunately you do need to have seen Prometheus to understand David’s motivations and how he got onto the Engineer planet. In fact, none of the movie would really make any sense had you not seen Prometheus. It feels like Ridley Scott initially set out to make Prometheus 2 and looked at what everybody’s problems were with Prometheus and decided to bridge the gap. We get a somewhat stand-alone Alien movie but tries to tie up the loose ends with Prometheus. A lot of what Prometheus established – the creation of life, the Engineers… it’s very quickly glossed over or forgotten about in Covenant. That isn’t a bad thing! I admit it… I didn’t like Prometheus because of all the mumbo jumbo. I wanted an Alien movie with Xenomorphs and Alien Covenant delivered that. Let’s talk about casting. Katherine Waterston (Fantastic Beasts) plays Daniels who actually looks a lot like Ripley. She’s a fine actress, I don’t have anything against her. Michael Fassbender obviously returns to play a loopy David but this time he’s also playing Walter – an updated android aboard the Covenant with a different accent. Even though they’re androids, they’re two very different personalities so it was nice seeing them interact. Billy Crudip plays Oram who becomes captain of the ship while Danny McBride as Tennessee brings some comic relief as the chief pilot of the Covenant. Demián Bichir, Carmen Ejogo, Amy Seimetz, Callie Hernandez and Jussie Smollett play more crew members. We get a flashback appearance from Guy Pearce as Peter Weyland and Noomi Rapace makes a cameo appearance in a hologram. James Franco also makes a minor appearance as Captain Branson – Daniels’ husband who perishes at the beginning. I liked the Covenant cast a lot more than Prometheus’. What is interesting about the characters here is most of them are couples – it is a colonization mission after all – but each one of them has obviously similar interests to protect their other half and unfortunately, they all eventually lose their partner. Alien Covenant was shot in Milford Sound, New Zealand. Instead of the baron landscapes of Prometheus, New Zealand brings mountains, lakes and rainforests. As with all Ridley Scott’s films, there is a great visual style throughout the movie and it matches Prometheus fairly closely. Odd Studios and Creature Effects Inc. handled the makeup and animatronic effects while Animal Logic created the digital effects. The CGI for the Covenant spaceship and landscapes are fantastic. Most, if not all, of the creature shots are CGI – physical suits were made but according to the commentary, these were merely for reference and any shots featuring practical suits were replaced with digital effects. The creature CGI is far from perfect but I don’t think it’s all that bad upon my second viewing. 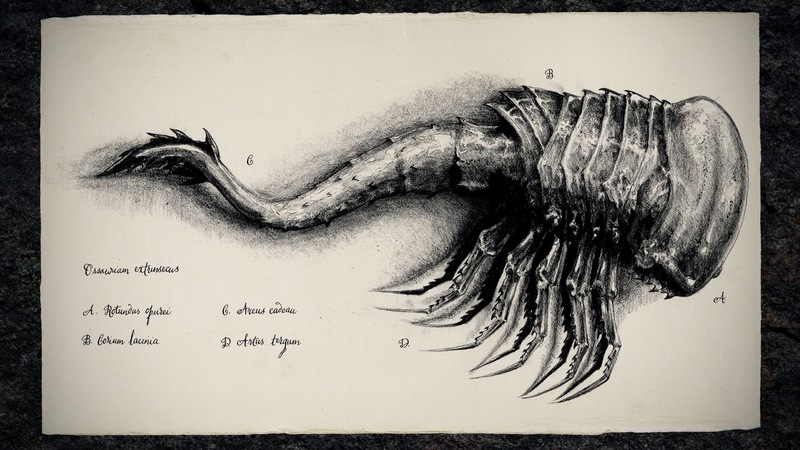 In Prometheus, we got some pretty terrible and uninspired creature designs which could have been taken from any movie – the Hammerpede, the Trilobite, a Mutated Fifield. 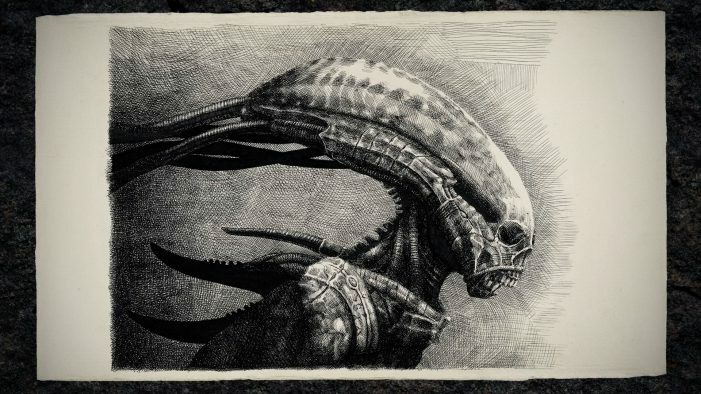 They were about as far away from Giger’s original designs as you could get. I’ll grant you that, the Deacon was a lot better but unfortunately came too late in the movie. Alien Covenant brings in brand new creatures – the Neomorphs which are almost translucent and are based on early concept designs from Prometheus. These things are actually ferocious and seem to possess much more resilience to bullets. Let’s back up for a moment and talk about how the Neomorphs actually appear. So the crew land on the Engineer planet and explore the nearby caves. Two crew members get infected through spores in the ground (which was caused by David dropping the pathogen onto the planet) and one of them is taken back to the lander where he is quarantined with Karine. What follows is one of the best sequences I’ve ever seen out of the entire series – up there with the original Chestburster scene in Alien. We’ve all seen a Chestburster bursting out of somebody’s chest countless times before. Ridley Scott has done something completely fresh and exciting here. A baby Neomorph erupts from the crew member’s back in a very graphic way! The entire sequence – the music, the tension, the gore – everything about it was done extremely well. The Neomorph breaks free and viciously attacks Karine and Faris with blood everywhere. I always thought Prometheus was very tame on the R-Rating but Covenant goes the whole nine yards and matches violence found in Alien 3 and Alien Resurrection. The lander explodes in the chaos and the baby Neomorph in the other crew member bursts from his mouth. What follows is another great sequence of two now larger Neomorphs attacking the crew in the wheat fields. The cinematography was quite remarkable. My only gripe is that the scene was over pretty quickly. But I really love the Neomorphs – these things do look like precursors to the Xenomorphs and I really wish Ridley Scott had put these in Prometheus. I wouldn’t have minded if you’d have based the whole movie around the Neomorphs. David rescues the remaining crew members and we soon learn of his intentions and we learn that David killed Shaw and in a flashback, we learn he dropped the pathogen onto the Engineers, killing all of them. The Engineers don’t play any further role in the film which people may be upset about. I prefer it though. I’d even go as far as to not have them in the film at all. Seeing them all stood there in their robes and running for their lives… the mysteriousness of the Space Jockeys has been ruined, I’m afraid. I am glad Ridley Scott has closed the chapter on the Engineers once and for all. 20th Century Fox did release “The Crossing” prologue segment separately that featured Shaw reattaching David’s head. I actually wish they’d have left that in. You wouldn’t even really know that Noomi Rapace was in the film otherwise. After spending 10 years in solitude, it has actually driven David crazy, despite being an android. We learn that David has been experimenting with the pathogen in his workshop of horrors. You can actually find David’s drawings as a feature on this Blu-Ray – check them out, they’re quite to interesting to look at. Covenant soon shifts gear and we’re soon introduced to Alien Eggs and Facehuggers. Design-wise, they’re similar to what we know and love – some slight alterations to make them look like earlier versions. Despite what many people think, I don’t think it was ever Ridley Scott’s intention for David to be the original creator of the Xenomorphs. These Aliens are just one particular strand that he has been experimenting with and as such, have slightly different traits to ones we saw in Ripley’s journey. Oram unwittingly becomes David’s first victim to his new experiments and what should have been an amazing moment, is ruined by David’s madness. Okay, I can forgive skipping the Chestburster phase in the Xenomorph life cycle – it happened to the Bambi-Burster in Alien 3 and these are a different strand of Xenomorphs. But David raising his hands in the air and the baby Xenomorph doing the same… it was cringeworthy to say the least. In the original script, it was a Chestburster so along the way, Ridley Scott changed it to a baby Xenomorph – probably just so he could do that scene. The pacing ramps up considerably and the remaining crew members make their escape and we soon meet the new adult Xenomorph. It’s very similar to ones in previous Alien films except more aggressive and erratic. It was nice seeing it rampaging across the planet surface towards the Covenant ship. As before, the CGI is a bit hit and miss with the creature. Close-up shots look pretty good though. We then get a huge thrilling set piece of Daniels fighting the Xenomorph on top of the spaceship. The movie still isn’t over… another Xenomorph is on the ship and goes on the rampage. The shower scene between Ricks and Upworth was pretty unexpected – it’s the type of thing I would have expected from AvP Requiem but it actually works and their deaths are brutal! Look out for some misty Xenomorph POV shots soon after – that’s the first time we’ve had those since Alien 3. Daniels and Tennessee battle the creature and eject it from the ship. They enter hypersleep and we learn that Walter isn’t Walter – he is in fact David! Unfortunately, I knew this from early on in production so it didn’t come as a shock to me. I guess it was kind of obvious though there really wasn’t any telltale signs until the film’s climax. David brought along some Facehugger embryos and plans to continue with the colonization mission. Where the heck does the series go from here? Time will tell if Fox allows Ridley Scott to continue with his sequels. There is really a lot to love in Alien Covenant. The visual style, the cinematography, the effects are all absolutely brilliant and what we have come to expect from Ridley Scott. The Neomorphs are a wonderful addition – we also had Facehuggers and Xenomorphs roaming around. The film is definitely far gorier and horrifying than Prometheus. A shout out has to go Jed Kurzel who did the film’s creepy score. I’ve listened to it a few times separately and it’s a joy to listen to. One of the best I’ve heard in a long time. I really struggle to find any major negatives with the movie. Alien Covenant isn’t a classic like Alien or Aliens… you’d be silly to expect that. What it has done has got the franchise back on track again after a terrible string of movies we’ve had to endure in the last 20 years. I’ll preface this and say that I’m in no way an expert at judging picture and sound quality – I’m just a movie buff but as expected, Alien Covenant looks absolutely top notch on Blu-Ray. Dariusz Wolski, who previously shot Prometheus, returned as the cinematographer on Alien Covenant. Instead of Red Epic cameras, he chose to shoot the movie on Arri Alexa XT cameras. Let’s not forget Alien Covenant was not shot in 3D like Prometheus so Alexas were “the most reliable, consistent camera” according to Wolski. Presented in 1080p (or 4K if you bought the Ultra HD Edition), Covenant looks equally as stunning as Prometheus on home media. Prometheus takes place on a pretty baron rocky planet while Alien Covenant features rainforests and lakes. It was shot in New Zealand, afterall. But despite the lush vegetation, Covenant still has a similar darker palette like Prometheus. That might not be to everybody’s liking, however. A lot of scenes take place in dark tunnels or the creepy citadel and despite that, the picture quality is still really good and full of detail. The sound of Alien Covenant is presented in DTS-HD Master Audio 7.1 (while the 4K Blu-Ray has the newer Dolby Atmos) and it’s crisp and clear throughout the movie. As I said earlier, I absolutely loved Jed Kurzel’s score so you’ll definitely get a kick out of hearing the eerie music on a great home theatre system. The standout track is “The Medbay” with the backburster… the way the music just keeps building and thumping along with the strange horns – it’s fantastic. Then we have the creepy clicking and screeching sound effects from the Neomorphs themselves. From the beeping sound effects aboard the Covenant to the actor’s dialogue, it’s all wonderfully clear. The big set pieces such as the initial neutrino burst or the Covenant ascending from the planet sounds really immense. Those of you with surround sound will appreciate the wheat field attack where you can hear bullets and Neomorph screeches coming from behind you. Moments like that are rare though and Alien Covenant really isn’t reference material for a great home theatre system. Ridley Scott returns to do another commentary and I don’t think this one is all that different from the Prometheus commentary. You’ll find little nuggets of information scattered throughout about why certain things were done and the philosophical aspects behind the story. It would have been nice to have a commentary with the writers or the effects crew as these usually tend to be the more interesting ones from a behind-the-scenes point of view. As Ridley said at the beginning, this is an unplanned off-the-cuff commentary so don’t expect too much from it. There are almost 18 minutes of Alien Covenant deleted scenes and unfortunately, there really isn’t anything spectacular here. Just minor scene extensions. The section starts off with an extended prologue scene including additional dialogue between David and Peter Weyland. The next scene is David in his greenhouse. There are more scenes featuring additional dialogue between Oram and Daniels and Daniels and Walter. An interesting scene is “Daniels Bedroom Flashback” where we see Daniels and her partner Branson in an apartment on Earth during a snowstorm. “Crossing the Plaza” shows the characters standing in front of a huge hole in the plaza. They toss a flare down which shows Engineer spacecrafts resting at the bottom. More scenes include more dialogue between Daniels and Walter and Rosenthal praying. Another scene has Walter talking to Oram and Daniels about David. The last scene features more dialogue between Oram and David descending into the Egg Chamber. You can read a full breakdown of the deleted scenes here. Unfortunately, the two scenes that I really wanted to see are not here. There was a new scene in an early test screening outside the citadel with Daniels and Lope being attacked by the Neomorph and Xenomorph. In the novelization, the two creatures attack each other but that part might not have been filmed. Another scene featured in the test screening was an extended death sequence of Ricks and Upworth in the shower. Meet Walter was a promotional viral video released online and lasts over 2 minutes. It features two scientists in masks building Walter from scratch – kind of like Westworld. The song playing over the montage is “I feel you” – by Melanie de Biasio. Phobos is over 9 minutes long and features seven of the Covenant crew members including Daniels, Oram, Lope, Tennessee, Rosenthal, Hallett and Walter being prepped for the mission in a medical bay. They are taking part in a ‘Fear Assessment’ and are strapped in with their vitals being monitored. A voice off screen asks for their strengths, what they are feeling, what scares them. They then are forced to watch video recordings of various creatures and people screaming. Strangely, the last shot of the recording is that of Brett from Alien being killed by a Xenomorph which would obviously have been impossible for them to have seen. The voice asks them how they feel after seeing that. The Last Supper was released online in February and features the crew of Alien Covenant having a party. Ricks starts to choke on some food and Walter knocks it out of her. Daniels then gives a speech about the colonization mission they are embarking upon. The Crossing was released online in April and is a 2 ½ minute segment showing what happened between Shaw and David on their journey to the Engineer planet. Shaw reattaches David’s head to his body and sets a course for their planet. While Shaw was in hypersleep, David began doing research about the Engineers. The feature ends with David reaching the planet and he is about to begin a bombing raid upon the Engineers. This section was in the original test screening last year and it’s a shame it wasn’t included as it helps bridge the gap between Prometheus and Covenant. Advent is almost 7 minutes long and is a transmission taking place in David’s laboratory which shows his various creature creations and illustrations. The video is shown from David’s first person perspective and shows him experimenting with the black liquid. David narrates the video explaining what happened between him and Shaw and what the black liquid actually does. The video concludes with the ending of Alien Covenant with David on the ship with the Facehugger embyos. David states there is still one thing he has yet to perfect – a Queen. This is quite an important video and it does make his motivations for what he’s doing a lot clearer than in the actual film. Master Class: Ridley Scott is the main behind-the-scenes documentary on the set and lasts for over 55 minutes. It’s split into four different sections with the first being about the ‘Story’. The segment starts off talking to the writers Dante Harper and John Logan about developing the script from Prometheus. The feature then moves onto ‘Characters’ and we have interviews with Amy and Benjamin Rigby, Katherine Waterston, Billy Crudip, Danny McBride who discuss their characters and what it was like working with director Ridley Scott. Michael Fassbender talks about playing two different androids – David and Walter. The next section of the featurette is ‘Setting’ which is all about the production design including the creation of the Alien Covenant spacecraft, and environments. For the planet, they shot on location in New Zealand. 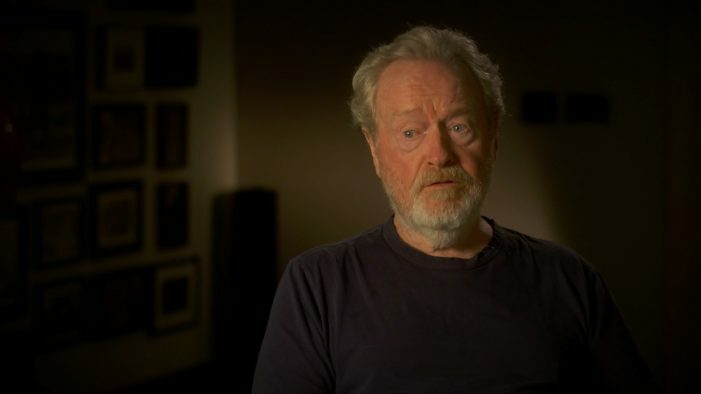 Ridley Scott wanted to return to Alien with narrow corridors and dark, claustrophobic tunnels. The feature moves onto David’s laboratory containing all of his drawings and creature experiments and we have interviews with artists Dane Hallet and Matt Hatton who drew the sketches. The last section is ‘Creatures’ and it delves into the creation of the Eggs, Facehuggers, Neomorphs and Xenomorphs. Despite looking like everything was CGI, they did indeed build actual creature costumes but I believe these were merely for reference. I kind of wished there were more information about the scenes they filmed such as the back-burster scene which was quickly glossed over. This section includes a myriad of illustrations with handwritten annotations of research done by David while he was stranded on the Engineer planet. He begins documenting the indigenous plant life on the planet and then explores the creatures on the planet such as snails, worms and aquatic life forms. David’s artwork moves onto both male and female Engineers and how their bodies are made up on a biological level. Finally, we come to the Neomorphs, Alien Eggs, and Facehuggers as David speeds towards creating a perfect Xenomorph. There’s lots of in depth information and intricate details about the biology of the creatures. This is the most interesting and fascinating section on the Blu-Ray disc. 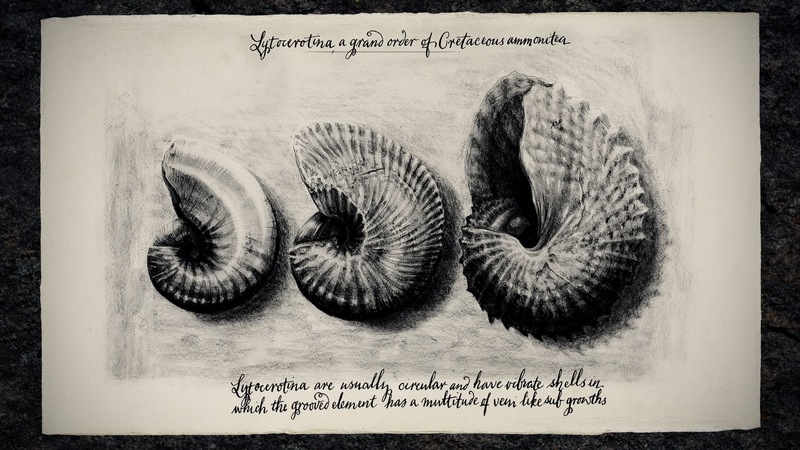 The illustrations really do look and feel as if they’re drawn by a scientist. If you basically liked the old Anchorpoint Essays website, you’ll love this section. The production gallery features lots of concept art from Alien Covenant. 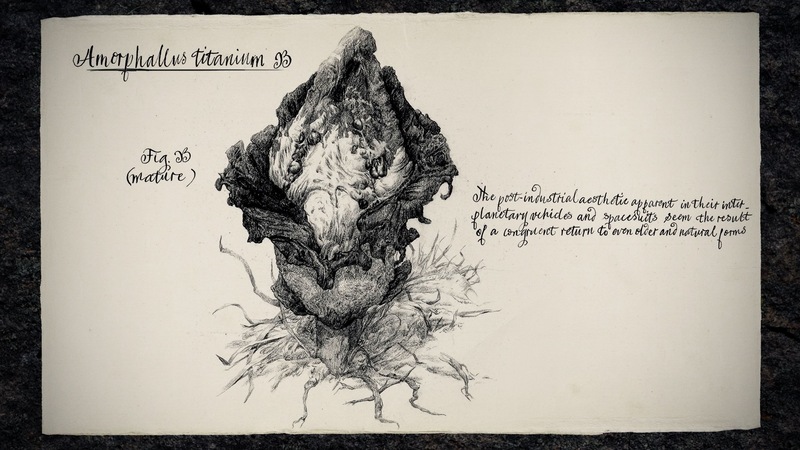 We have Interior and Exterior of the the ‘Covenant’ spacecraft, ‘Daniel’s Apartment’, the ‘Engineer’s World City’, the ‘Juggernaut’ as well as lots of creature art and renders of the Neomorphs, Eggs, Facehuggers and Xenomorphs. There’s art showing the environment of the planet as well ‘Logos and Patches’. We also have a return of ‘Ridleygrams’ which include storyboards and sketches that Ridley Scott drew himself. Lastly, we have two of the final Alien Covenant trailers that last for over 2 minutes each. I really liked Alien Covenant – I’d say it’s my favourite Alien movie after the Alien trilogy. Alien Covenant is what Prometheus should have been in the first place and it’s because of my unhappiness with Prometheus why I like Covenant so damn much. The only thing that really let the movie down is David’s loopy behaviour. Covenant is not a masterpiece like Alien or Aliens obviously, but I enjoyed it. I’d give the movie itself 8.5/10. The Blu-Ray features excellent picture and sound quality but if you obviously have a 4K HDR TV as well as Dolby Atmos, go for the 4K edition rather than the 1080p release. Unfortunately, the special features are somewhat lacking. The deleted scenes aren’t all that interesting, a lot of the viral videos we’ve already seen before and the making-of documentary isn’t anywhere near as good as the Furious Gods feature on Prometheus. Charles de Lauzirika who produced the excellent Alien Anthology and Prometheus sets wasn’t involved in this one which explains why the special features seem so lacking. The highlights will be ‘Advent’ and ‘David’s Illustrations’ where we learn more about David’s workshop of horrors. I still feel Fox are holding out on more stuff so I wouldn’t be surprised it there’s a Special Edition a few years down the line. I just purchased ALIEN COVENANT and as they included many of the viral material and even two trailers in the Bonus Features, I do not understand why the Crew Messages which had been released on YouTube are missing from the BD/UHD/Digital releases. Completely disagree with the review. Alien:Covenant lies far from being a “proper” Alien movie. The trite tropes – evil android, unsuspecting colonizers, same ole facehuggers and facehugging, and the stupid, unscientific, unprofessional, and diluted characters, some of which began in Prometheus but which are magnified in Alien:Covenant – are married to a divorce, Ridley’s divorce from the protagonist, story, and grand question and pursuit posed in Prometheus: who made us and who made our makers. Why does our maker want to destroy us? If you are satisfied with the mere presence of xenomorphs without a captivating tale to tell or characters you care about (with the exception of Fassbender, this was the worst casting in these series since AVP: Requiem), then your standards are exceedingly low. Alien: Covenant must be obliterated, erased completely from the A, P, and AVP canons. In its place lies a large space for a proper Prometheus sequel/Alien prequel/Predator tie-in film. The universe is a big place, and the Engineers sowed their oats in many places with many different results! The reviewer put a great deal of effort into this review and if Fox read reviews like this and other in depth conversations they can get a sense of the difficulty they have. It isn’t so much that I cannot relate to the review based on my views, it simply shows we all come to this franchise with widely different expectations and views. From what I can understand before Ridley made Prometheus there was already a segmented view point amongst the fanbase. A sizeable majority seem to want a rerun of A L I E N S and still do. Some come from the AVP side being interested in an action orientated monster movies and related materials. Others have a great love of A L I E N and everything after that was disappointing. Prometheus brought back in my generation that remember A L I E N and liked the thought provoking nature of Prometheus which was “all about everything” and interestingly found the dysfunctional crew and its megalomaniac sponsor and faith based Shaw who found the guts to survive flawed yes, but real. With Covenant he has bon fired Prometheus and aimed to rerun A L I E N except that he has repeated one element of Prometheus which is wrong for this movie, low exposition. A routine entertaining film like Covenant should give us some clear answers particularly from the 2nd act but we are left with the same degree of speculation of Prometheus which was deliberately enigmatic. Once you add the novelisation and the shorts you can argue until the cow gets face hugged what precisely and why what actually went down in the ten years. I can say I couldln’t disagree more with the review – thats not the point – the point is the audience is so segmented and the films so lacking in a clear sense collectively of what they are that if Ridley dares to listen to the feedback and then as he did with Prometheus misinterpret it ( people wanted clarity of narrative and more bullet proof characters and plausible action beats not more xenomorphs) the level of frustration will just grew. I have been thinking about where Prometheus might go for five years and thoroughly enjoyed the anticipation right now the wick is turned right down, almost off. It’s one-sided because I didn’t really have any problems with the movie other than David’s behaviour. Prequels not sequels dude. Avp galaxy need new writers possibly? I agree. It did feel somewhat quick though. Godzilla 2014 came out in May but didn’t hit home video until September if I remember correctly. I was expecting the same or maybe November for Covenant, but it’s irritating when you have to wait an extra 4-6 months to see a movie you’re excited about. Personally, I’d love it if movies only spent 1-2 months in theaters before hitting the shelves. The last movie I saw in theaters was Jurassic World, the projector had busted pixels which were showing on the screen, the audio was “cranked-up” so high it was almost painful, the screen had large stains on the right side, and the children in the audience were going crazy. So that was it for me. I’ll take an early release date and my living room chair any day of the week. Great Review. My favorite aspect of the film was Kurzel’s score. So haunting and nostalgic. What an awesome job. I also enjoyed the deleted scenes, particularly Phobos and Advent, and also the blade runner reference from David. Overall though, I personally lean more toward disliking, than liking the film. Having now watched it a second time, it does feel as though Covenant has a difficult time deciding exactly what sort of film it wanted to be. It also felt somewhat too fast-paced, especially the last 3rd of the film. The overabundance of characters made sufficient character development difficult, leaving most of the crew to be nothing more than fodder. In the original film, when Brett or Dallas died, it was a noticeable loss that affected the direction of the entire film. More intimacy and depth, for lack of a better description. David’s place was throwing off too many Flintstone vibes to take it seriously. Plus showing the neomorph sneaking in, the Alien in the daylight scene, and attacking a machine like it wasn’t very intelligent, and many other things, it was just tough to like this one. I’m glad there are a lot of people who enjoy it. It’s great to have a new Alien flick that hits all the right buttons for you. Honestly, I think Covenant would have done better if it had just been a full tilt Alien or Prometheus style movie. It tried to be all things and it just didn’t go well. “An egotistical android struggling to find love and purpose lashes out violently as Aliens invade the sleepy town of Bedrock”. Nevertheless, I’m glad others like it, and I hope the studio will decide to take the series in a different direction now. The ‘David hasn’t had maintenance’ explanation I have an issue with. Although mentioned by writers and actors I think this is sort of a premise rather than an answer. His whole project and ambition to wipe out the engineers and humanity, to create a new perfect organism was already at work when he arrived with Shaw at Paradise. So his pursuit of this twisted master plan had begun before the ‘no maintenance’ space in the timeline. He already hated humans and hated engineers. He already experimented on Shaw perhaps when she was still alive – this is something we still don’t know. Back in Prometheus when Shaw asked him what happens when Weyland’s not around, he said ‘I’ll be free’. So most of David’s traits and motivations were already in place even before he arrived at Paradise, so I don’t think we can explain his arc by this ’10 years without maintenance’ notion. David essentially believes he is superior to both humans and Engineers, and sees himself as a God and as Walter noted ‘that next visionary’. These are all character traits we can trace back to his ‘father’, Weyland. So rather than interpreting David’s actions and ambitions as a product of ‘no maintenance’, I see that as just a premise and starting point from which to delve into the character rather than an actual explanation. As you would expect a ‘son’ to do David carries the flame of Weyland’s arrogance, hubris and egoism. Similarly, looking at David as a crazy robot is also again a premise rather than an end point. A robot can’t be crazy because it’s a robot. I think the point of David’s character is that he symbolises rationalism without moral compass, because of course he has no soul, and how terrifying such knowledge and power can be when free to operate without moral guidance. This ties in with Ash’s admiration of the xenomorph in the original Alien when he talks about it’s purity and freedom from notions of morality. For those saying this was released in a too short a time frame to home video…The time passed of 3 months from theater to release really isn’t that bad. I mean Guardians of the Galaxy 2 is already out on home video and that only released 2 weeks before Covenant was released in theaters. As for the home release, I got the 4K copy and watched it last night, it looks stunning. So good sometimes it’s almost 3D. The HDR is fantastic with this release and if you have a Dolby atmos home theater the sound is incredible, as this release has support for that. Very curious to see how well this does sales wise on home release. I will definitely be picking it up when it’s out in the UK. Not a lot of time has passed, a mere 3 months since the cinema debut means this is the shortest time I have ever seen a major studio movie jump from cinema to home release. This film only stopped showing its “last chance to see” screenings 3.5 weeks ago. Also it is pathetic 20th Century Fox is releasing this so soon in the USA but believing UK fans would or will wait until September 18th? ALIEN COVENANT already has the title of most torrented movie of 2017 so far. Can’t wait to watch all this on my new Blu! Well, just ordered the DVD 9don’t own a Blu Ray player). Look forward to watching this film, again. WHY OH WHY wasn’t some or most of “advent” used in the film? It would only add the to macabre, Hammer-horror flavour of Covenant. If ever there was a reason to “facepalm”. also why did they have to include extended scenes with MORE DAVID instead of i dont know, the ones from the testscreening? even if t was just to see how things would have been? While it was beautifully shot, this movie had little going for it. Pacing that built no suspense, characters that had no depth, deaths that had no consequence. Aside from a some great visuals, this was probably one of the worst films in the series, to me. I think the flashes of alien footage in Phobos are prophetic associations for the audience, not actual clips from the footage the crew is being shown. Both Prometheus and Covenant are prequels to the 1979 Alien release, are you sure you have this correct in your opening paragraph? I liked Covenant, but it ended up making itself and Prometheus much weaker for glossing over the lore set up by Prometheus. Prometheus had it’s writing problems, but at least it was trying to put some new material and backstory into the Alien franchise. The concept of the Engineers could have worked if handled by better writers, and instead we’re left with an Alien film in Covenant that, while entertaining, was ultimately predictable and filled with sci-fi horror tropes, even moreso than what its predecessor was criticized for. I guess, ultimately, it’s too bad that Prometheus got rewritten from the original script; what Covenant showed us from the material that was ultimately cut in Prometheus (i.e. neomorphs) was how well that material works. That original script is kinda like if we took the good from Prometheus and the good from Covenant and merged it into one, truly good film. Great Review. Very direct and informative. Thanks for posting. It takes time for something to become a classic, cult or canonical. Shame about the lack of extra creature shots or anything in the way of a director’s cut. What I liked about Alien Covenant: Visual of the movie, monster design, final fight in the space ship, people vs. neomorphs in the grass (but my excitement ended very soon, the scene was too short). What I did not like: Original music from Alien was recycled too much. Being on a planet with no helmets on (at least in Prometheus David (a machine) said that the air is breathable). Aborting the main mission because of a weird transmission. People slipping on the bloodstained floor like in a comedy movie. Doing stupid decisions like touching everything, going for a walk alone (what a good idea on a planet full of monsters) or shooting on pressure bottles and blowing up the ship. Nobody asking question why is the city full of dead bodies. Nobody asking a question why an engineer ship crashed in the direction out from the planet. No chestburster. David as an alien designer. Engineers mythology buried underground. Cheap plot twist (is it David or Walter on the board of the space ship?). David and Walter flute scene (the scene could be shorter). Alien surviving the heat of the rocket engine – so why is it afraid of fire? Daniels being Tarzan. What a coincidence that Walter’s alien embryos fit perfectly into the embryo storage drawer of Covenant. Total score: The movie is not bad, it is a big disappointment, which is worse. It could have been a good movie if it was treated carefully. You had a typo seven words into the second sentence..
Come on this is published.. The lack of either new creature footage and alternate deaths Rosenthal and the shower couple,no extra creature shots was a waste.